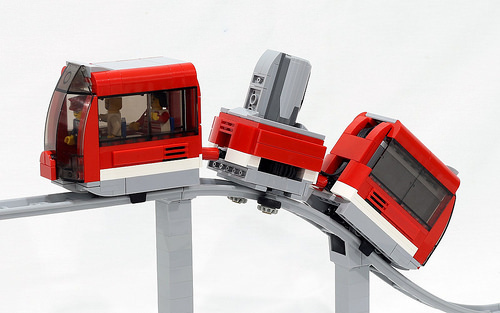 Hearkening back to the 80s LEGO Monorail with its centre-engine car and retro look, Jason Alleman has come up with another fantastic kinetic powered creation. This time he has built a motorised train for the new LEGO rollercoaster system. Jason is using an ingenious design with Technic half bushes and rubber tyres to attach and propel the mini monorail. Watch the video to find out more about the challenges he faced and overcame to create this cute little piece of LEGO nostalgia.